Tech Lighting’s Linger collection is designed with twelve LED lights shaped by acrylic cylinders illuminating in multiple directions. Available in polished nickel and natural brass that will slowly patina for a timeless look. 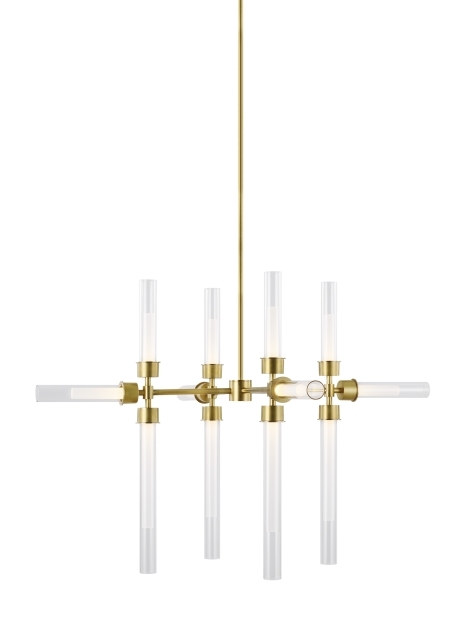 This modern chandelier creates a beautiful statement piece for your dining room, living room and foyer. Complete the look with more Linger chandelier and wall sconce options. Lamping options are compatible with most dimmers. Refer to Dimming Chart for more information. Includes 48 watts, 2444 total delivered lumens, 3000K LED modules. Dimmable with most LED compatible ELV and TRIAC dimmers. Includes (4) 12" and (2) 6" rigid stems in coordinating finish. Can be installed on a sloped ceiling up to 45°.